This March 5 culminated the days of rest for the Carnival holiday Ecuador 2019. Sure, you're already thinking. When is the next holiday in Ecuador? And here we have the answer: In April come holiday days and correspond to Holy Week 2019. According to the calendar of holidays 2019 of the Ministry of Tourism, on April 19 we will have a new holiday in the country. This corresponds to the so-called Good Friday. That is, this holiday will be a long weekend: Friday 19, Saturday 20 and Sunday 21 April 2019 to rest. Keep in mind the best, this holiday is NOT RECOVERABLE. Keep in mind that the celebration of Holy Week in Ecuador includes the development of several liturgical ceremonies. In each region, city or locality of the country, it is celebrated in a diverse way. The recreation of the Viacrucis; the Construction of Mount Calvary; the Preaching of the Seven Words; the Descent processions throughout the week; and, finally, the Glory Mass on Easter Sunday, are part of the religious acts that take place from Palm Sunday to Sunday of Glory. On Good Friday the Way of the Cross is remembered, that is the name of the path that Jesus had to travel, carrying on his shoulders the wood on which he was to be crucified. His death on the cross and his grave. It constitutes the central core of Holy Week. Holy Week is a celebration that should be of reflection, of recollection, of recount, nevertheless, apart from the ceremonies that take place inside and outside the catholic and evangelical temples, the majority of the population is dedicated to the enjoyment of the holiday. The tourism industry has this possibility of doing business. How is Easter in Ecuador? Holy Week in Ecuador is the annual commemoration of the passion, death and resurrection of Jesus of Nazareth. The most spectacular during Holy Week is the procession of Jesus (Jesus of the Great Power) in Quito. Around 250 thousand people gather in the streets to observe this magnificent parade and witness mysterious devotion. The celebrations also take place in Guayaquil with the procession of "Cristo del Consuelo", and in Cuenca, where the feast begins on Palm Sunday, then with the visit to the seven churches on Holy Thursday, followed by the procession of the " Passion of Christ "on Good Friday. They march in the procession of the penitents through the ecclesiastical district of Quito. They should walk barefoot and bound with thick, heavy chains as a form of redemption for their sins. 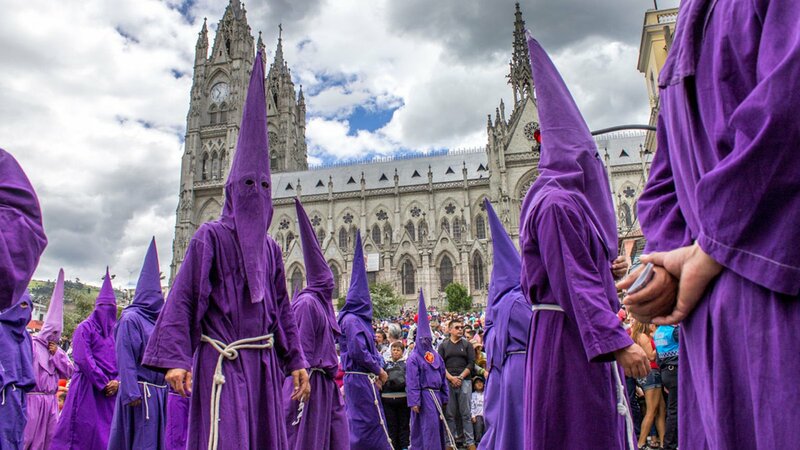 The women dressed in purple robes, their faces covered with veils represent the "Veronicas." They pay homage to the woman who wiped the face of Jesus with her veil. In Alangasi, south of Quito, people dress like demons and parade through the city to the church on Easter Saturday. It is burning clothes during the procession to symbolize the fire of eternal punishment. On Holy Tuesday, Puellaro, a community north of Quito, holds a parade in honor of Christ's entry into Jerusalem. They raise twelve platforms through the streets, each of which has a key figure of the gospels. Meanwhile, Easter in Ecuador means something completely different in rural areas. In the Chimbo Valley, farmers spend the week caressing their fruit trees while insisting, "Do not be lazy! Give your fruits! " On Gloria's Saturday, the streets are full of people, there is music, and celebrations abound as families and friends get together to enjoy a break from the routine. Easter Sunday offers the perfect opportunity for Ecuadorians to attend church. Actually, Holy Week in Ecuador is lived unofficially weeks before it starts. The restaurants begin to offer in their special menu, the famous and delicious "Fanesca". This rich traditional soup is made up of twelve different grains, each representing one of the twelve disciples of Jesus. In addition, the fanesca takes pumpkin, cod, hard-boiled egg slices, pieces of green banana, fried bread, cheese and peanuts. This is the traditional dish of Easter and is a tradition that brings together entire families in the preparation and tasting of this delicious dish. The night before soak the cod in water to remove the excess salt. Cook all the beans separately. Cook the sambo and squash in little water and when it is soft proceed to liquefy. Cook the cod in a liter and a half of milk. Save that milk for the preparation of the fanesca. In a large pot we rehash the onion, ground garlic, butter and red butter. When the onion is crystalline, add the ground peanuts with a liter of milk and let it cook for 15 minutes, while still rocking. Then we add the mashed sambo and squash, chopped cabbage and other grains, including the chocho. We added the milk with which the cod was cooked and rocked constantly for 10 minutes to avoid burning. Add the milk cream and grated cheese over low heat and let it boil until the cheese is diluted. We decorate the fanesca dish with 2 slices of hard-boiled egg, strips of red pepper, miniature empanadas or fried mature, long pieces of cheese and parsley. Note: This dish does not carry water, if the fanesca is very thick, increase more milk. To peel the young beans, you have to freeze it and then proceed to peel. To prevent the cooked grains from being damaged, they should be left to cool without covering them. Holy Week is preceded by Lent, which recalls the 40-day preparation time spent by Jesus Christ in the desert. The central celebrations of Holy Week are Holy Thursday, Good Friday, Holy Saturday and Easter Sunday. Holy Week is a time to devote to prayer and reflect on Jesus Christ and the moments of the Easter Triduum, because Jesus, with his infinite mercy, decides to take the place of men and receive the punishment to free humanity from sin. In addition, Holy Week is the ideal time for the human being to meditate on his actions and the changes he must make in order to get closer to God and fulfill his commandments. During Holy Week, the Catholic fulfills various acts, such as processions, the staging of the drama of death and passion of Christ, among others. The penitents are subjected to harsh burdens as a symbol of their self-sacrifice and, on Good Friday, the faithful must keep fasting and refrain from eating meat. Holy Week was the last week of Christ on earth. His Resurrection reminds us that men were created to live eternally with God. We celebrate the triumphal entry of Jesus into Jerusalem in which all the people praise him as king with songs and palms. Because of this, we bring our palms to the Church to bless them that day and participate in the Mass. This day we remember the Last Supper of Jesus with his apostles in which he washed their feet giving us an example of helpfulness. At the Last Supper, Jesus stayed with us in the bread and in the wine, he left us his body and his blood. It is Holy Thursday when he instituted the Eucharist and the Priesthood. At the end of the Last Supper, Jesus went to pray at the Garden of Olives. There he spent the whole night and after a long time of prayer, they came to apprehend him. On that day we remember the Passion of Our Lord: His prison, the interrogations of Herod and Pilate; the flagellation, the crowning of thorns and the crucifixion. We commemorate it with a solemn Way of the Cross and with the ceremony of the Adoration of the Cross. The day that passed between the death and the Resurrection of Jesus is remembered. It is a day of mourning and sadness because we do not have Jesus among us. The images are covered and the Tabernacles are open. At night an Easter Vigil is held to celebrate the Resurrection of Jesus. Vigilia means "the evening and night before a party." In this celebration it is customary to bless the water and light the candles as a sign of the Resurrection of Christ, the great feast of Catholics. It is the most important and joyful day for all of us, Catholics, since Jesus overcame death and gave us life. This means that Christ gives us the opportunity to save ourselves, to enter Heaven and to live always happy in the company of God. Easter is the passage from death to life. Visit Ecuador and its hidden charms throughout the country ..! To truly experience the culture and diversification of Holy Week in Ecuador, come on vacation, and enjoy the wonderful hospitality of its people. Enjoy and be part of these traditions, live one of the many celebrations that make this country unique and wonderful.